The United States space agency says its Mars exploration vehicle has discovered chemical substances necessary for life. Scientists reported that NASA’s Curiosity rover found large amounts of organic molecules in 3.5 billion-year-old rock in an area called Gale Crater. The area on Mars is believed to have once contained a large lake. The discovery of organic molecules suggests that ancient conditions on Mars may have supported life. Jennifer Eigenbrode is an astrobiologist with NASA’s Goddard Space Flight Center in Maryland. She said there are three possible ways the organic material was created. “The first one would be life, which we don’t know about. The second would be meteorites. And the last one is geological processes, meaning the rock-forming processes themselves,” she said. NASA announced that Curiosity also discovered sharp seasonal increases in methane gas in the Martian atmosphere. This could also support the case for life. Ninety-five percent of the methane gas found in Earth’s atmosphere is produced by biological activity. Methane can come from animal and plant life, as well as the environment. However, researchers said it is too early to know if the methane on Mars is related to life. This is because the gas - just like organic molecules – can also be formed by geological processes. Eigenbrode believes the latest discoveries give scientists a good reason to keep looking. NASA’s latest findings were announced during a press conference last week and also released in the publication Science. This 2018 illustration from NASA shows the InSight lander drilling into Mars. InSight, short for Interior Exploration using Seismic Investigations, Geodesy and Heat Transport, launched from Vandenberg Air Force Base on Saturday, May 5, 2011. 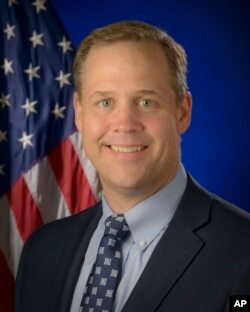 Earlier this week, NASA Administrator James Bridenstine met with reporters to discuss the agency’s goals. He said there will likely be major changes related to the International Space Station (ISS) program. President Donald Trump’s recent budget requests for 2019 have called for ending space station funding by 2025. The U.S. government estimated it has spent more than $75 billion on building and supporting the International Space Station. After the space shuttle program ended in 2011, the U.S. has paid Russia to transport its astronauts to the space station. The first piece of the International Space Station was launched in 1998 and was completely finished in 2011. It has been used to collect information and carry out many experiments. Bridenstine said NASA is already in talks with private companies about possibly taking over the space station after 2025. But he added that any changes would have to be agreed to by the other 21 nations involved in the project. But no matter what happens with the space station, the NASA chief said the U.S. remains committed to keep sending astronauts into space for many years to come. Bryan Lynn wrote this story for VOA Learning English, based on reports from AP and NASA. Mario Ritter was the editor.